On this episode of Boiler Room the ACR Brain-Trust is having a Christmas party, Boiler Room style! We'll discuss some cringe worthy media oddities (per usual), the ridiculous hit piece penned by The Guardian in an attempt to demonize the impeccable independent reporting on Syria that 21WIRE and our colleagues have provided the world, the mistrial of Cliven Bundy, land rights in the United States, the overt politicization of the new Star Wars ... See More movie, several absurd fake news stories being promoted - analyzed, UFO psyops in the MSM and the death of LaVoy Finicum. 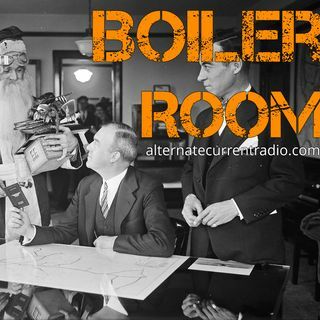 Join ACR hosts Hesher and Spore along side Andy Nowicki of the Nameless Podcast, Infidel Pharaoh, Randy J (ACR & 21WIRE contributor) and Patrick Henningsen of 21st Century Wire for the hundred and fortieth episode of BOILER ROOM. Turn it up, tune in and hang with the ACR Brain-Trust for this weeks boil downs, analysis and the usual gnashing of the teeth of the political animals in the social rejects club. Infidel Pharoah.......What a joke if he is you Middle east Insider.